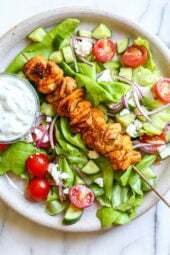 This Mediterranean inspired salad is made with Grilled Chicken Shawarma kebabs served over salad with Feta and Tzatziki. This grilled chicken shawarma recipe, made with chicken breast is on constant rotation in my house. I usually serve it with pita and salad. After sharing these Greek Chicken Tzatziki Bowls a few weeks back made with boneless skinless chicken thighs on skewers, I was inspired to try the shawarma with thighs instead, and turn them into kebabs. 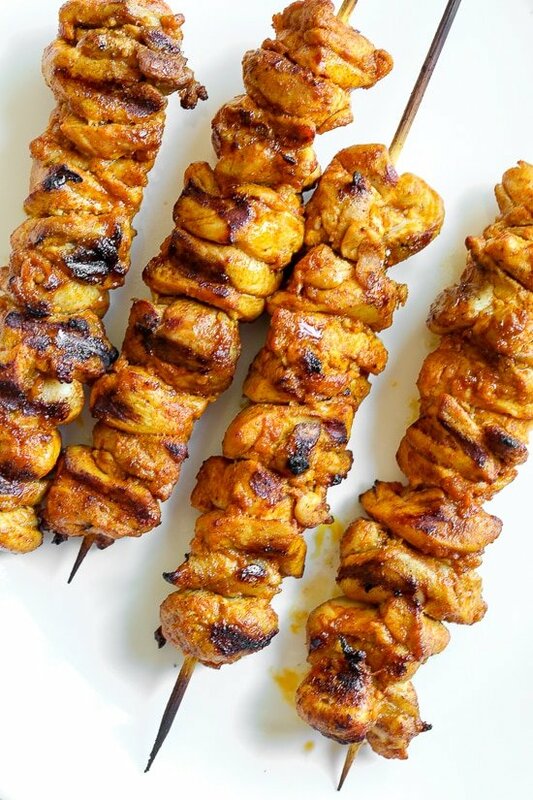 I loved how they turned out, the chicken is juicy and I personally love anything you can eat on a stick! I served it over salad to make it a meal, but if you are having a party and want to serve up some kebabs, these will be a hit! Cut the chicken thighs into 1-inch pieces. Add the garlic, cumin, paprika, turmeric, curry powder, cinnamon, red pepper, salt and black pepper and whisk again. Pour the marinade over the chicken making sure it evenly coat (careful it will stain your fingers). Refrigerate and marinate for at least 30 minutes, up to overnight. Preheat an outdoor grill or indoor grill pan to medium-low heat. 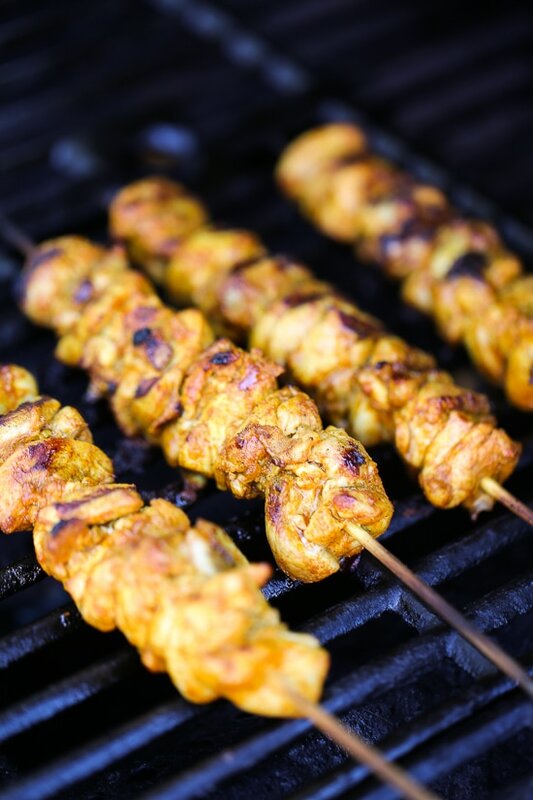 Thread the chicken pieces among 4 wooden or metal skewers, discarding the marinade in the bowl. 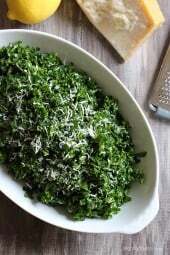 For the salad: In a medium bowl, whisk together the oil and vinegar and season with salt and pepper. Add the cucumbers, cherry tomatoes, and red onion and toss to combine. 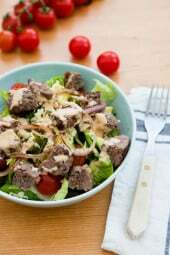 Divide the lettuce between 4 bowls, top with tomato salad, feta and grilled chicken. Serve with Tzaziki for dipping. Found this recipe by accident and tried it yesterday for dinner and was astonished by it’s taste!I definetly recommend this dish!Unfortunately I could not find ‘Kosher salt’ and forgot the Feta… But it was still so tasty, especially with the skinny Tzatziki! Holy crap, this chicken was good! I was too lazy to do the kebabs…plus it wasn’t grilling weather, so I cut the chicken up smaller. After marinating I just dumped it all in a pan and cooked until the chicken was done & the marinate got nice and thick. I will definitely be making this on a regular basis. The whole family enjoyed! This is AHHH-MAZING! Ended up leaving chicken in marinade for 48 hours due to u expected late work on first night. Entire family loved it. Going to make it for a spring dinner party I’m having in a few weeks. Sure wish WW would work with you so I could link your recipes right up to my tracker. Love your stuff. Thanks so much for sharing. Best recipes site in your site I love it thanks for sharing. Oh my gosh! I just made this and it was so good! My family ate it all up! Will definitely make again and SOON! I have tried this today and it was absolutely delicious. Thank you for the recipe. Excellent! I broiled the chicken with chunks of sweet onion in the oven. Marinade was amazing, especially for as quick and easy as it was to put it all together. Will definitely will be making it again. I currently have the chicken marinating. However, the ingredient list for the chicken calls for 1 teaspoon of kosher salt, but the directions say 1/4 teaspoon. I went with 1 teaspoon…we’ll see how it turns out. I’ve been told it is wonderful! Thanks! I corrected this, it’s 1 teaspoon. Oohhh La La! These chicken skewers were the best I have ever had! I love the authentic flavour!Thank you so much for creating this recipe! It is definitely going to be our ‘go to’ grilling recipe! This marinade is AMAZING!! I didn’t have time/interest to cut up chicken so i just put full chicken breasts in the marinade, let it sit for 6 hours and then bbq’d them. They were fantastic. Just ate 1 for lunch cold and am super looking forward to one warmed up for supper tonight. Another big hit Gina!! this was awesome! next time, i want to marinate overnight (i only had time for like four hours this time). my husband has already asked that we add this into heavy rotation. I was hoping to get some buy-in on a new dinner option for my kids and I — I turned to the “kid-friendly” tag results, and let my son browse. He chose this recipe which he called “chicken on a stick.” I was nervous about the spices but BOTH of my kids scarfed this down and said it’s their favorite chicken recipe ever. My son liked it so much he started looking through other cookbooks for recipe ideas. I’m still in shock. Thanks for a great family-friendly recipe! Amazing – the entire family loved it and asked for it again the next day! Delicious! Used green leaf lettuce instead of the butter lettuce. Allowed the chicken to marinate all-day before threading onto skewers. Served with the Skinny Tzatziki. Tastiest chicken we’ve made on the grill. Simple, delicious, perfect for summer. Just made 8 of these in jars for the week so hubs and I have yummy lunches. 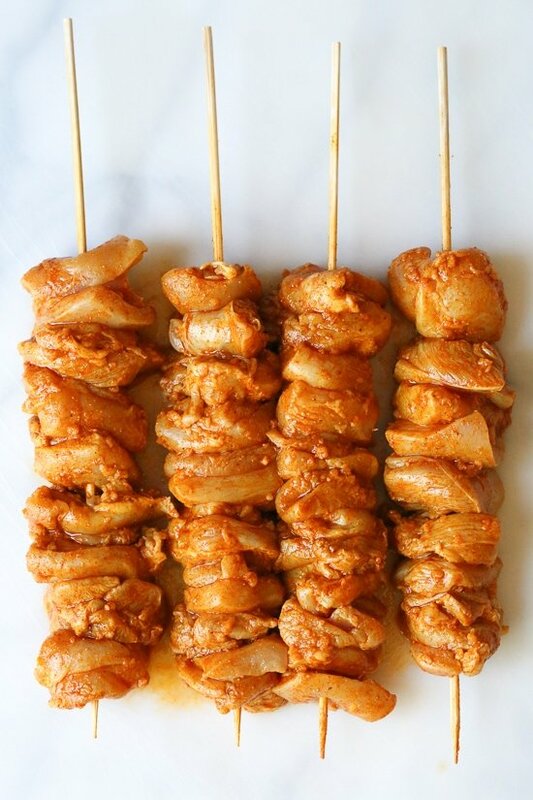 I am too lazy to make skewers (plus, no grill pan) but I willl be trying this out – except cooking the thighs Whole and then slicing up after cooking. I have this marinating in the refrigerator right now. II can’t wait to try it! I haven’t made these yet, I confess. But when I don’t feel like dealing with the grill, or cleaning my grill pan, I just use the broiler. I broiled mine in the oven for the same amount of time and they came out perfect. Flipped halfway through. Did you put on a skewer or lose in broiler pan? This looks delicious! I was wondering if you could leave out the curry or substitute something else for it? My family doesn’t like curry. Where do you find boneless, skinless chicken thighs? I’m on Long Island, too. I cannot WAIT to make this! 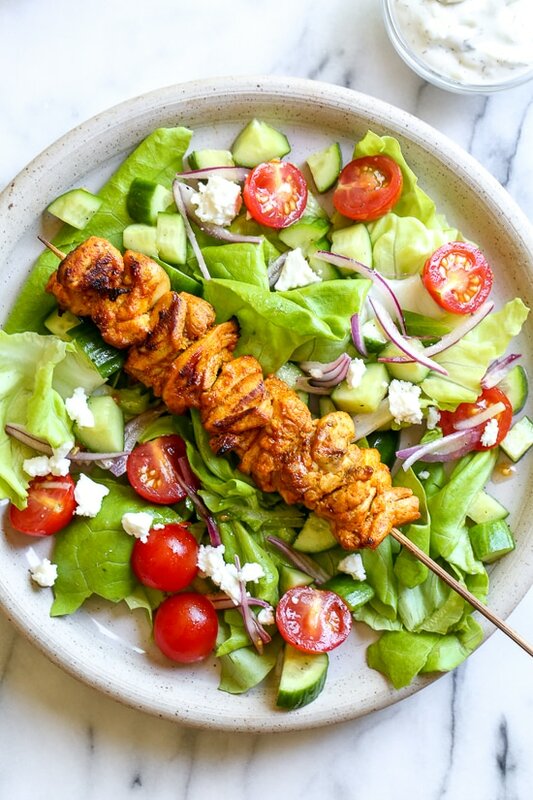 As the weather heats up I am all about the salads, I’ve also been eyeing a bunch of shawarma recipes on Pinterest but haven’t made any yet…I love everything I’ve made off your site so I know this will be delicious! Does the nutrition information include the dressing or is that separate? everything is included, thank you!